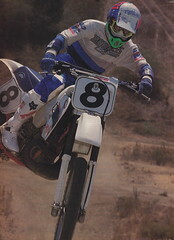 Here is another classic from my personal motocross collection. This is a catalog from Moto-X Fox in 1979. Today known as Fox Racing, Moto-X Fox was started by Geoff Fox in 1974 and has grown into one of the most successful brands in the motocross business. If this wets your appetite for more Fox Racing info, make sure you check out the History of Fox Racing articles I did last year over at Pulpmx.com. In them, company founder Geoff Fox and I go through Fox Racing’s history year-by-year and look at all their products and ads.